Bass Culture in collaboration with the mighty Island Rockers Sound Systemhave once again summoned the powers of Panda Dub to our shores. 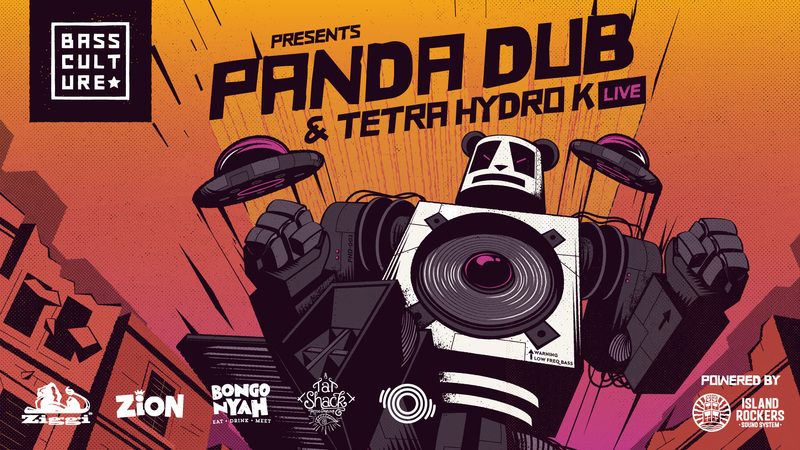 And this time the Panda has teamed up with the crazy chemists Kanay&Krilong a.k.a Tetra Hydro K for a full on French bass invasion, to save the islanders. Armed with LFWMOs (Low Frequency Weapons of Mass Orgasms) and other secret weapons, our fate is in their hands. Panda Dub needs no introduction to the local scene, this being his 3rd visit to the island. The project was born in 2007, in Lyon. Panda’s style is a perfect blend of ethnic samples, edgy and powerfull electro tunes, and heavy rythm, always pushing the boundaries of dub. Panda Dub built his reputation on the web, with 7 album releases, including his latest masterpiece titled Shapes and Shadows in March 2017, all available in free download on ODGProd.com. Tetra Hydro K is the name of a laboratory based in a secret location, run by Doctors Kanay and Krilong. Their research concentrates on experimenting with organic elements (live musical instruments) in a computer-generated environment. When testing these musical concoctions, specialists have been left scratching their heads with unanswered questions : is it electronic? Acoustic? Dub? Dubstep? Drum and Bass? Why can’t I stop dancing? The duo also been venture out of their lab and practice live experiments in public, to great acclaim. The results of these chemical reactions, you will hear for yourselves on the 24th of June.